The Motak organizations here have temporarily withdrawn the economic blockade, giving a sigh of relief to the people of upper Assam. 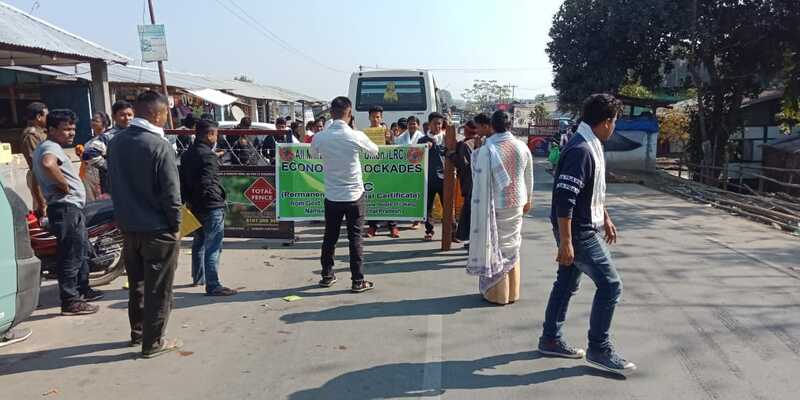 Several Motak organisations called the economic blockade from January 27 to February 11 demanding scrapping of the Citizenship (Amendment) Bill, 2016. Meanwhile, the recent economic blockade in upper Assam called by the Moran community has caused huge problems to the people. Hundreds of goods carrying trucks were stranded in upper Assam’s Tinsukia district. However, people are facing a huge crisis due to the shortage of LPG cylinders and other petroleum products because the trucks and the oil tankers could not pass through the NH 37 due to the blockade. “We have temporally withdrawn the economic blockade but if the government failed to scrap the bill then we will again stage economic blockade,” said a member of Motak organization. Widespread protests have been witnessed after the Citizenship (Amendment) Bill was passed in the Lok Sabha.